Welcome to Nurse Midwifery.org, the top resource for finding Certified Nurse Midwifery programs online and learning more about a Nurse Midwife career. We have dozens of Certified Nurse Midwife programs, including some online and hybrid options, as well as very specific programs depending on your current level of education. Nurse Midwives are becoming much more prevalent, especially with the emergence of birthing centers and specific Women's Centers within traditional hospital settings. More and more women are choosing Midwives to deliver their precious children every single day. A Master of Science in Nursing, or MSN, is the most common degree that allows you to sit for the CNM exam, offered only by the American Midwifery Certification Board (AMCB) . All Nurse Midwife programs accredited by the Accreditation Commission for Midwifery Education (ACME) provide the necessary education for graduates to be eligible to take the examination offered by the American Midwifery Certification Board (AMCB) and become Certified Nurse Midwives; in addition, two of the education programs provide the necessary education for graduates to be eligible to take the AMCB examination and become Certified Midwives. The Associate Degree in Nursing to Certified Nurse Midwife program is somewhat uncommon, but there are 11 programs in our database. View all ADN / RN to CNM programs. The Bachelor of Science in Nursing to Certified Nurse Midwife program is a fairly common program, with over 15 available in our online Nurse Midwife program database. View the top BSN to CNM programs. The Doctor of Nursing Practice Certified Nurse Midwife program is available with 11 different programs that are in our online Nurse Midwifery program database. View Doctorate of Nursing Practice CNM programs. Welcome to Nurse Midwifery.org, the top resource for finding Certified Nurse Midwifery programs online and learning more about a Nurse Midwife career. We have dozens of Certified Nurse Midwife programs, including some online and hybrid options, as well as very specific programs depending on your current level of education. Here are the top Nurse Midwife Programs in our online directory. A Nurse Midwife is a high-level Advanced Practice nurse with an Advanced Nursing Degree and Nurse Midwife certification. Nurse Midwives are licensed to deliver babies and advise women throughout their pregnancy. Nurse Midwives must be certified by the American Midwifery Certification Board (AMCB). The top accrediting board for CNM programs is the Accreditation Commission for Midwifery Education (ACME). 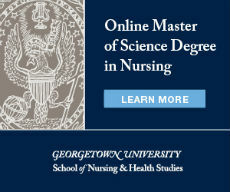 Become a nurse-midwife with Georgetown University’s online Nurse-Midwifery/Women’s Health Nurse Practitioner program. Through hands-on clinical experiences, you will learn to care for women during the childbearing years and throughout the life span. Becoming a Certified Nurse Midwife is not an easy task, but with the right guidance you can figure out your best path. As with many advanced nursing degrees, choosing your path depends on your current level of education. The most common pathway programs to becoming a Certified Nurse Midwife is the MSN, or Master of Science in Nursing. Oftentimes these are combined with Womens Health specialty tracks, and most MSN programs require you to already have your RN license (you have to pass the NCLEX-RN for an RN license), while some others require an RN license and a BSN degree, or Bachelor of Science in Nursing. However, there are Nurse Midwife programs designed for many levels: Associates Degree in Nursing to RN to CNM certification programs for instance. Likewise, there are advanced doctorate degrees that also allow you to sit for the Certified Nurse Midwife exam. The nursing field is highly diverse and includes a variety of specialties suited for all people. Nurse midwifery is one of the growing subfields of nursing, which deals primarily with women’s reproductive health care from pre to postnatal. This fascinating field has the potential to give nurses a career that provides nutritional counseling, education, and healthcare visits for couples or individuals interested in starting a family. Nurse Midwifery.org provides dozens of nurse midwifery programs across the United States that are ready for prospects to browse. Whether on campus or online, nurse midwifery programs and subject to accreditation by the Accreditation Commission for Midwifery Education (ACME). It is important to review the requirements of each program in order to find the most fitting candidate. Upcoming professionals that seek information about this degree program should focus on the must-haves of great education so that they get the most out of this endeavor. In order to ensure that a degree can be accepted from state-to-state, a degree program must be accredited by the appropriate accreditation authority. Our team has listings of every single accredited program in the U.S., helping new and existing students find the best universities with reliable resources. 39 programs listed on this site are accredited by the Accreditation Commission for Midwifery Education (ACME). How Can You Become a Certified Nurse Midwife? Students that are interested in this field are likely seeking information on how to pursue a lifelong career such as this one. The educational requirements for this career have changed in recent years, making it impossible to receive certification under the graduate level. According to the American College of Nursing Midwives, 82% of nurses in this field hold at least a master’s degree. A small percentage of nurses hold doctoral level degrees and there are some nurses at the bachelor’s level that received certification prior to the change in requirements in 2010. As of 2010, all applicants entering into this degree program were required to hold at a minimum a graduate degree (ACNM, 2009). The path to becoming a nurse midwife begins with the right degree program. There are several different options for those that are either just beginning their education or for those already involved in the nursing field. Graduates that have already completed a bachelor’s degree in a discipline other than nursing can take part in a degree transition program that lasts 3 years on average and introduces material for both RN studies and midwifery. With this option, students are given the opportunity to continue education to a master’s level and even receive post graduate certification in nursing midwifery. Nurses at the bachelor’s level with licensure can begin an MSN/CNM program that can be completed in 2 years on average. Associate’s degree level nurses can even take part in a bridge program that promotes their degree to bachelor’s level and then pursues master’s level once that is completed. In addition to associate’s and bachelor’s level promotion programs, there are also Doctor of Nursing Practice options available for those at a higher degree level. These programs are for students that have either already achieved a Master’s degree in Nursing or those wishing to move straight from bachelor’s to doctoral level with one program. Regardless of which program is fit for students, completion of the program sets students on the right track for the American Midwifery Certification Board exam. This is a standardized test set forth by the AMCB to test the skills and knowledge of students that have completed the program. Successful completion of this test alongside educational requirements can qualify graduates for licensure. Online and partially online nursing midwifery programs are also available for those that seek flexible options to fit into busy schedules. These programs typically require students to attend retreats or seminars throughout the length of the program. Certificate programs are also available for individuals wishing to add nurse midwifery to their portfolio. Since society is living in the digital era, it is only natural for students to have a profound interest in online degree programs. Online nurse midwifery programs provide students with a more convenient path to a successful career, without the added sacrifice of time from traditional educational programs. Online nurse midwifery programs are available throughout the United States, with a variety of path options. Just as standard midwifery programs, online CNM programs provide educational degree paths for graduates at the associate’s level, bachelor’s level, and even master’s level. Depending on what level a graduate is currently at, there are options for advancement into higher realms of nurse midwifery. The importance of accreditation when pursuing a degree is outstanding. A degree’s accreditation provides an assurance that states will accept the degree and allow licensure. The Accreditation Commission for Midwifery Education (ACME) is highly recognized by the U.S. Department of Education for its excellence and reliability in the accreditation of nurse midwifery programs. Programs that have received accreditation by this agency have proven that their curriculum is on track for what is required of degree programs in this specialty. When choosing a degree program online, the most important step is verifying that the university is accredited by this authority. One of the most intriguing aspects of choosing a degree program is the end result. Students that are considering nurse midwifery programs want to know their career capabilities and salary potential prior to choosing the right program. Nursing is a great field to find potentially profitable careers, so higher level nursing specialties tend to pay more on average. We have gathered data from the Bureau of Labor Statistics to assist learners with getting a better idea of their potential earnings after graduation. In addition to the positions listed below, graduates can possibly pursue careers with family nutrition services, parental counseling and education, and even postnatal care. Please be sure to contact us if you have a certified nurse midwife program to add, or an adjustment to a program we have on our site!